I say this over and over, and most likely I've said it on this blog a time or two, but I feel so very lucky to be able to be creative for a living. It's something I never take lightly, and I am grateful for every single opportunity I have to create. "Making" makes me happy. I can't explain to you why exactly, it just does. It scratches a very deep itch inside of me. This project that I'm about to share with you brought me so much joy during its creation, I can hardly believe it was a "job". 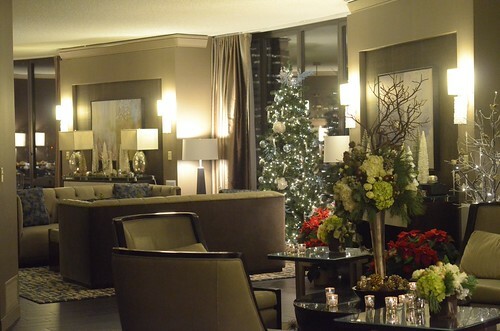 My very favorite client brought me on board again to help create arrangements and decorate the Presidential Suite at the Seattle Westin for their company Christmas party. If you would like to see what we did last year, please visit this post. 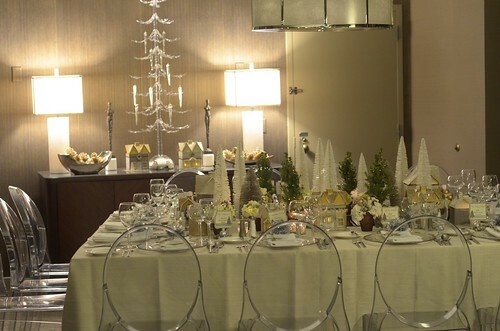 Even though the party was small, just sixteen guests total, our ideas were big, and every available surface was adorned. 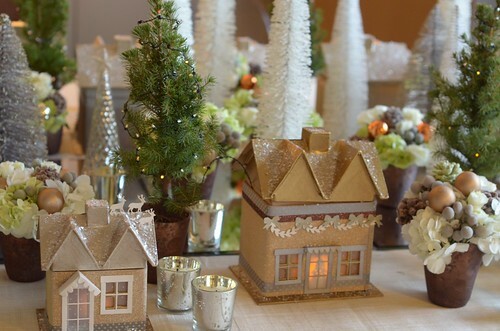 On the center of the 8ft square dining table, I created an elaborate holiday village. It was layered and dense with many, many details. I placed several rectangular mirrors in the center, and built the small city around them. The houses were simple paper forms that I found at an art supply store. I painted their roofs and sprinkled them with "snow". 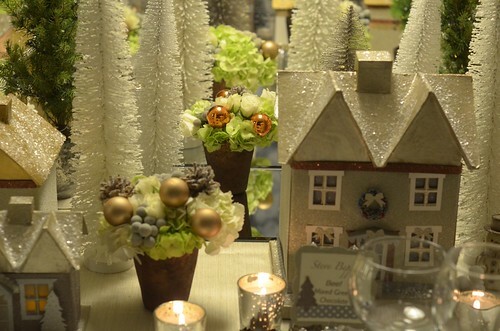 The sides of the houses were covered in glittered paper in slivery browns, golds, taupes, and warm metallics. The "landscaping" was a mix of tiny, fresh trees, bottle brush trees, and compact floral arrangements. 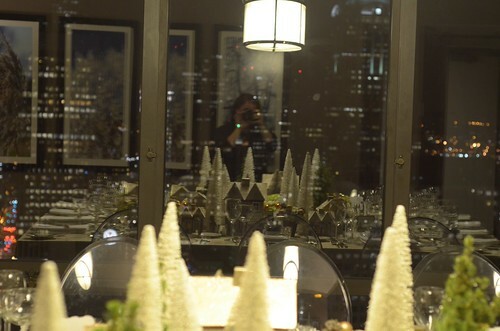 The green trees were lit with tiny lights - the bulbs were no larger than a grain of rice. The houses were trimmed with paper wreaths, bows, and garlands. 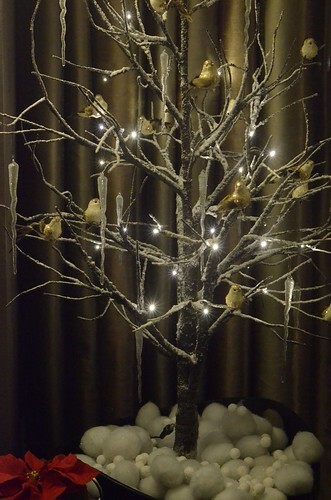 A faux votive placed inside each house gave them warmth, and brought the silhouettes in the windows to life. 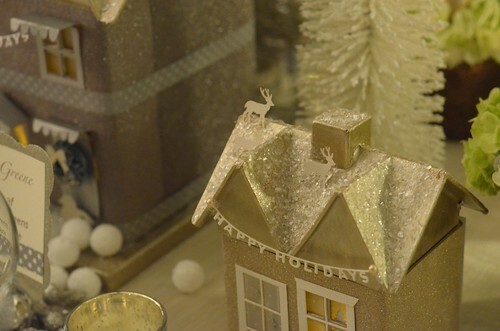 There were many tiny details for the guests to discover, like the reindeer on the roof of this little house. 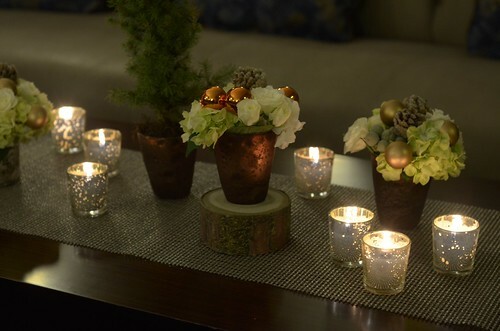 The arrangements were a mix of metallic and natural elements. 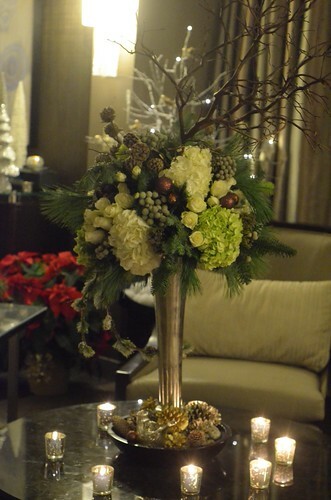 I used hydrangeas, ivory spray roses, berzillia berries with christmas balls and glittered pinecones. There were lots of candles too, which brought the sparkly elements to life. Choice provided the beautiful linens and chargers for our table. Liza assisted us with our selections and Claire did the linen installation. There is an art to placing a table cloth and folding a napkin. I didn't know this until I saw Claire work her magic last year. We rented acrylic "Ghost Chairs" for the table. I love their lightness next to the density of our table. The view from the Presidential Suite is outstanding. Honestly, I don't think there's a better view of Downtown Seattle . I love how our tiny tabletop town is dwarfed by our big city. 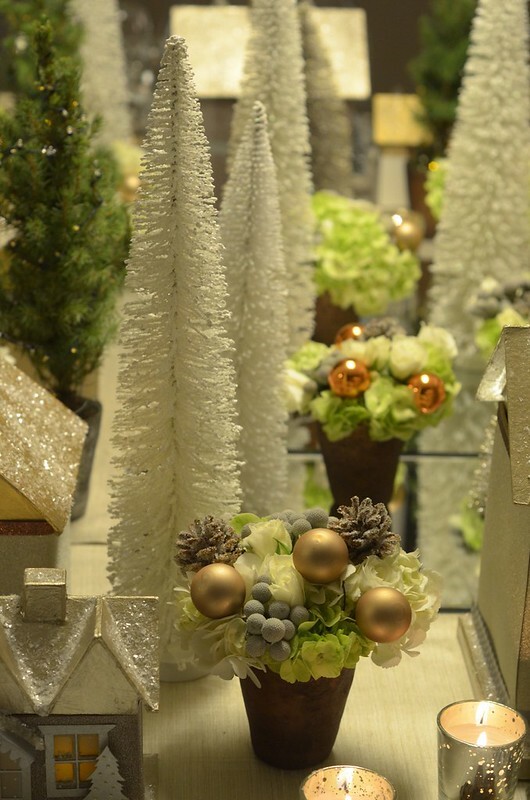 Linda, my client, has a great collection of holiday props. We both had fun putting these pieces into place. There were flowers and candles strewn about the room to warm the space. You would never guess by the serenity of this photo what a mad scrabble it was to get everything moved into this space on the 47th floor, set up, and cleaned up. 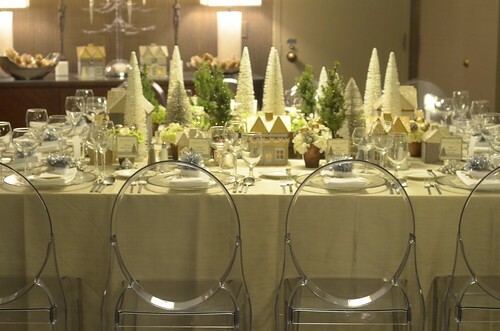 Getting these tasks completed before the guests arrived for the party was a Christmas Miracle! Working on this event was most definitely the highlight of my year, and perhaps the highlight of my floral/crafting career thus far. Thank you for giving me this amazing opportunity to create for you, Linda. It was a joy. Laurie, if I had the resources I'd want you to create my entire life. That is stunning. Laurie, the table is stunning. 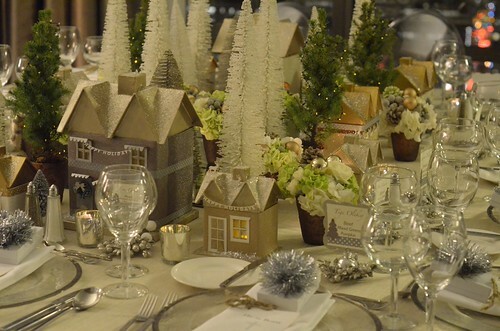 Although our Christmas village isn't quite that beautiful, it will be finding a new home on our table for Christmas dinner this year. My husband will LOVE it! Wow, Laurie! This is just gorgeous! What lucky guests! How could you not feel special sitting at this table? What beautiful work, Laurie. Congratulations on a job well done. Laurie, I am stunned by the beauty of this beautiful holiday scenery. How talented you are! I am truly inspired by your creativity. Congratulations on this fabulous decorative coup!! Gorgeous! 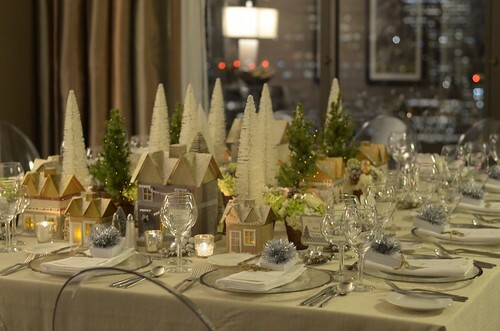 This table setting must have been the talk of the evening, and the start of lively conversation amongst the guests. So it likely served the multiple purposes of decoration, atmosphere and starting conversations. I cannot imagine the customer as anything but over the top thrilled. I know I would be! Okay so, I read all about the kitties, one of my very favorite blogs. But I had no idea what you did for a living. My gosh - I can see why you get paid for that - gorgeous! You are so talented! Wow Laurie! I am in sheer awe of your talent. Such serene beauty in that village. 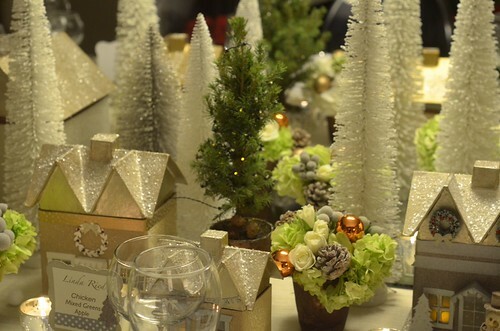 And I looked at last year's table...equally gorgeous! Wow Laurie! Wonderfully amazing! and with the help of little kitties too! I hope your Christmas was as magical as you made it for those lucky guests. I love the holiday landscape. I found a cake plate you made on pintrest with a tree stump and a cut of a tree. Im a cake decorator and this is just what Im looking for to place my cake on for the Oklahoma Sugar arts show. oh my goodness!!!!! those houses are just MAGICAL!!!! Honestly, what an incredible triumph!!! Love it! amazing to see such a creation.